Hurricane season is June 1 to November 30th which means it’s still fair game when it comes to hurricanes. After surviving Hurricane Matthew and more recently Hurricane Irma, I thought it would be helpful to share what I’ve learned. I know, so cliche, but so true. My husband teased me all throughout the time we were waiting for Irma, because he said I was over doing it. I did laundry, washed and braided my daughter’s hair, blew up flotation devices and gathered water apparel, bought knee-high rain boots for me and my neighbor (they were on sale for 18 bucks), made crockpot meals, filled all the tubs and sinks with water, gassed up all the cars pulled out the generator and had hubby get extra gas, bought batteries in every size, packed clothes for three days, pulled out candles, weather radio and flashlights, the grill and charcoal and yes, made sure we had a ton of non perishables and wine…lots of wine. But after all this, the reality is you are never truly prepared for a hurricane. Don’t worry about your kids too much, they’re resilient. 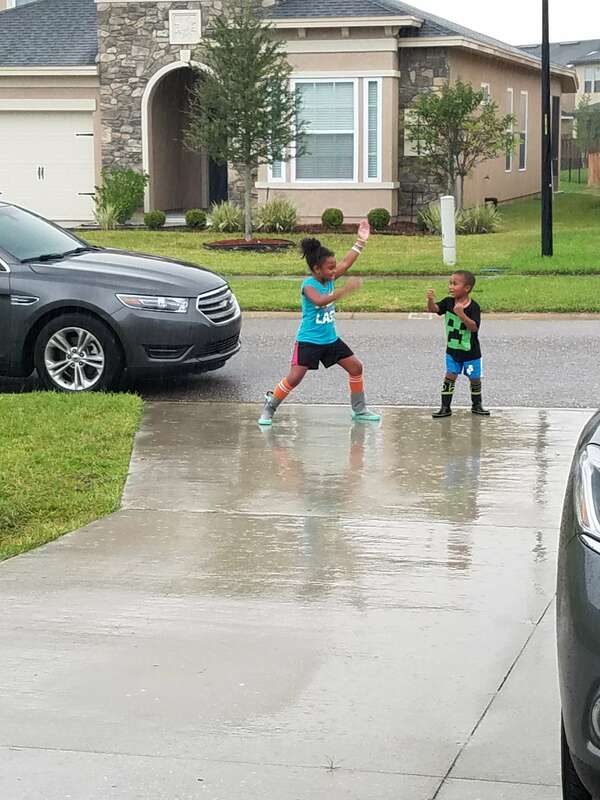 Kids playing in the rain before Hurricane Irma hit. While I worried about all the things that could go wrong, my kids were very openly hoping those same things went wrong. After hurricane Matthew, my kids are old pros when it comes to hurricanes. And because of it, they couldn’t wait for the power to go out. All the while I prayed it stayed on. All day I would hear them ask When are the lights going to go out? We wanna camp in the living room, eat fun snacks and play games. The don’t really understand the severity of what could happen. For them, its a fun and new adventure which is way better than having two kids panic over the possibilities. 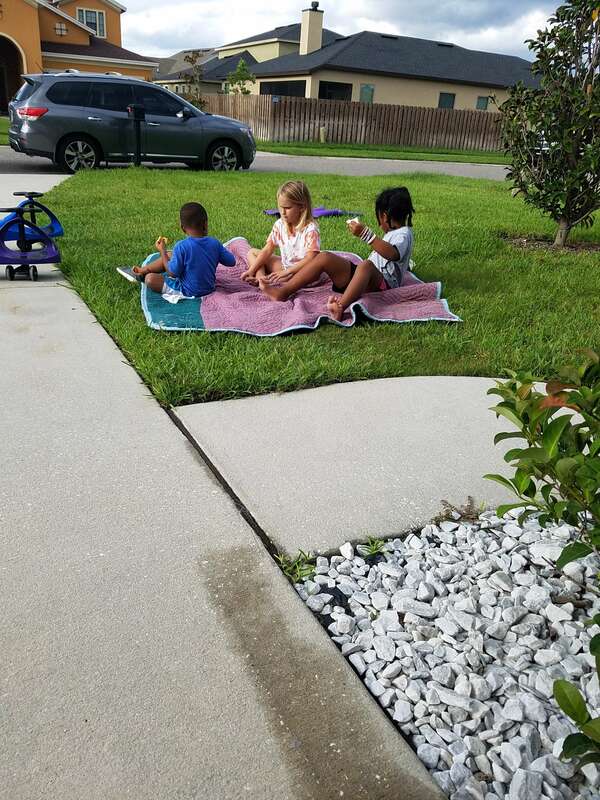 Kids having a picnic After irma, they were without power. survival mode. With survival mode, comes survival of the fittest mentality. Instead of taking just what’s needed for your family at the grocery store, you take in excess, not considering those who may come after you. It’s important that in times like these, we think about others. For my family, it was simply letting our neighbors, plug into our generator so that they wouldn’t lose the food in their fridge and could keep milk cold for their 2 year old. That meant we couldn’t plug up one additional thing, but it wasn’t just about us. 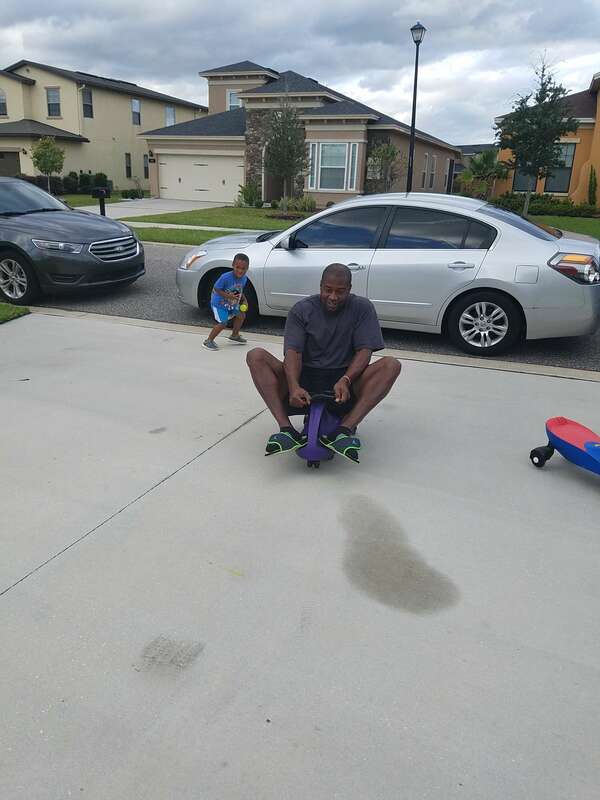 Hubby joined in on the Hurricane fun with the family. some good in all of this. With busy work and school schedules, we often loose sight of the simple things. Spending time with family and friends. This hurricane forced my family to be under one roof with each other without TV, wifi or any other distractions. That meant, more time talking to each other, laughing, playing and growing closer as a family. And after hurricane Irma passed and it was safe to go outside, we were able ,have impromptu playdates and to talk to neighbors, some of which we had never even seen before. 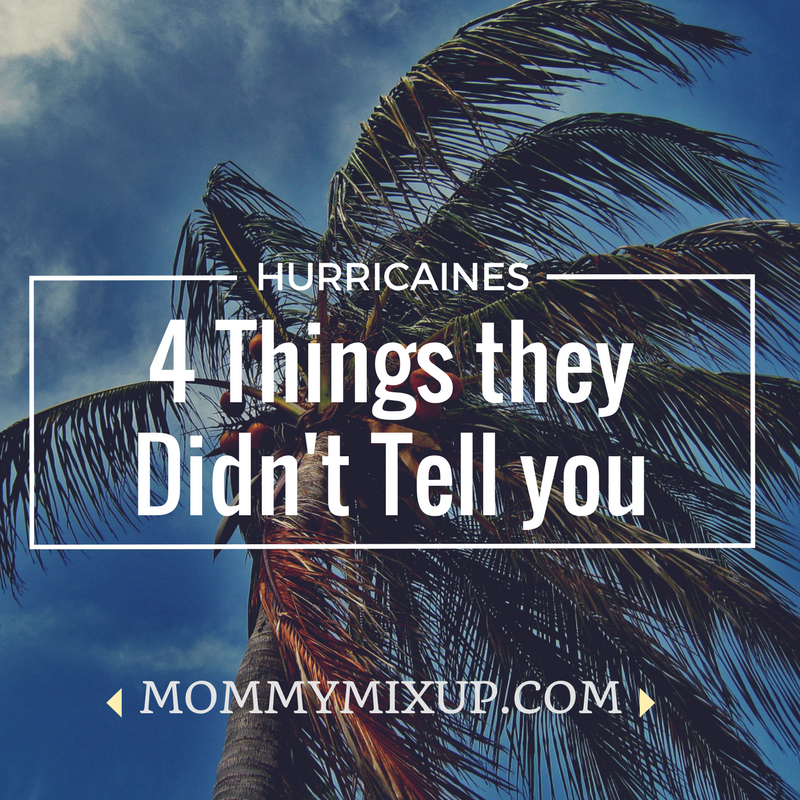 Some will argue these are things people should already know even if they aren’t facing a hurricane, but as I mentioned, sometimes we lose sight of things amidst the hustle and bustle of every day life. My hope is that this post serves as a reminder, even if you’re not preparing for a hurricane. I’m sure there are tons of “must remembers” I’ve missed. Hurricane season is far from over and I’d love to hear your suggestions, be sure to drop them in the comments below.